Magnum RT Steps Wheel to Wheel length step are the newest and most unique Truck Side Step Bars. 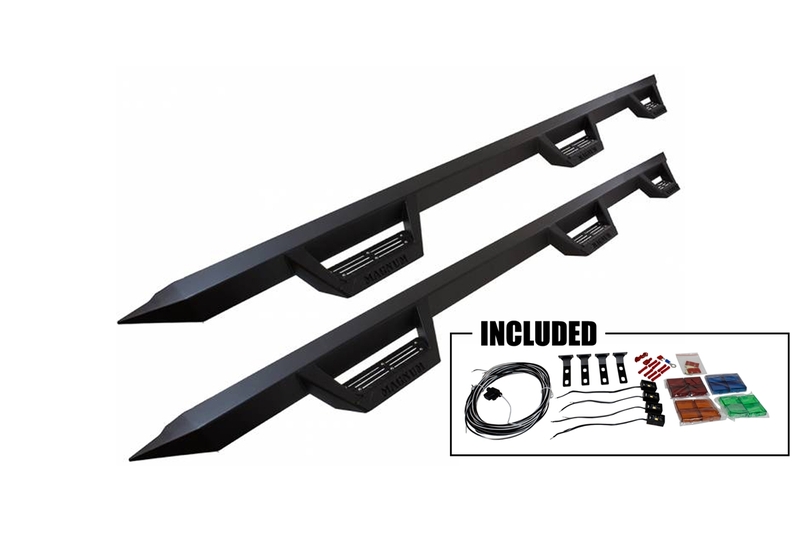 The RT Side Step Bar features a distinct drop down design featuring a wide step area for easy entry and exit of your truck or Jeep. The Side Step Pads have a non-slip diamond tread for added safety, and are slotted to allow drainage so that snow or mud does not collect as on a truck running board. Magnum RT Side Step form fit to your truck or Jeep lower rocker providing protection from rocks while off-roading and road grime on the street. Included with a bright 6-piece RT Step light kit with 5 color variations to make your ride really stand out.